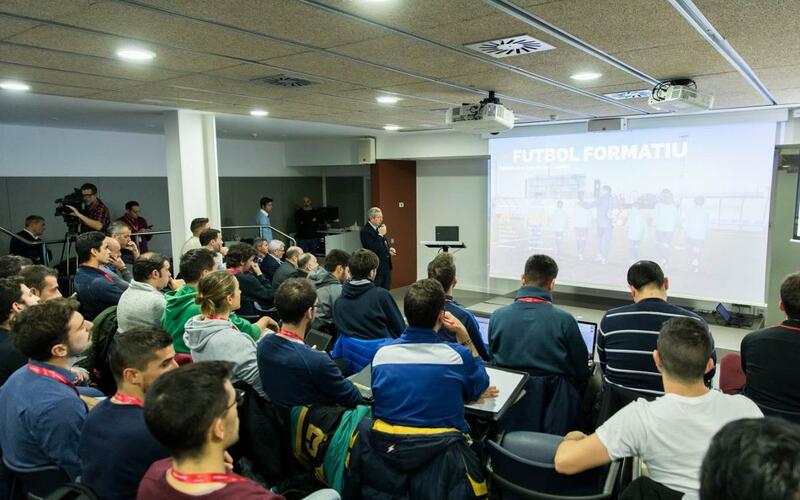 The third edition of the FCB Coaches Academy, for a hundred of the Club's coaches, is taking place from Monday, February 5 until Friday, February 16 at the La Masia facilities inside the Ciutat Esportiva Joan Gamper. These technical training sessions are directed by the Training Department of Masia 360 and by the Methodology Department of FCBEscola. The inaugural session was chaired by the manager, Pau Vilanova, and by the CEO of FC Barcelona, ​​Óscar Grau. During the next two weeks, students will have more than 50 teaching hours, with the aim of becoming the best coaches, educators and leaders. For this they will have renowned experts in different subjects, of which 85% are the Club's own staff. There will be master classes on game ideas (Pep Segura), methodology (Paco Seirul·lo), team management (Víctor Küppers), performance optimisation (Sergio Vallecillo), health, DNA professional sections (Xavi Pascual and David Barrufet) and sports coaching (Montse Cascalló), among many others. Those most responsible for this course - Pere Gratacós, responsible for the area of ​​Formation of Trainers of Masía 360, and Isaac Guerrero, responsible for methodology of the FCBEscola - recognise that these training sessions are unique all over the world and that they represent a great asset both for the new FCBEscola trainers and for the other coaches at the club. "During the stages of sports initiation, children have to have more of an educator than a coach. Sports leadership is the ability that a coach should have to positively involve the group. Athletes of these ages need a reference point who is a positive leader. "This year we expanded the teaching load with communication skills. We try to provide intervention tools for the coach, including conflict management and team management, with a session given by Victor Küppers. We include the Barça DNA of the professional sections, where Xavi Pascual will talk about handball, and also amateur sections of the Club. So, we have the vision that FC Barcelona is not just about football, but we are sports centres. "For FCBEscola it is a very important activity, since it is a way of completely immersing the forty coaches that have passed the first phase of selection for next season. At Club level, it makes us a reference point in knowledge and transmission of knowledge worldwide. Barça in this sense is a leader, who dares to do what nobody else does."